The 35-year-old Liverpool native became the WBC cruiserweight champion in 2016. 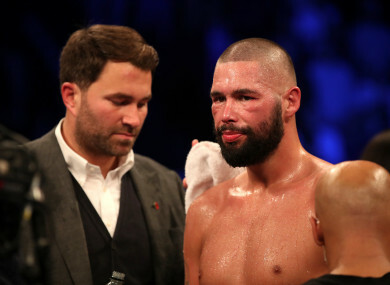 Tony Bellew alongside Eddie Hearn after his defeat to Oleksandr Usyk. FORMER WORLD CRUISERWEIGHT champion Tony Bellew has confirmed his retirement from boxing following his defeat to Oleksandr Usyk. Bellew indicated his intention to retire following that eight-round loss earlier this month, and has since confirmed his plan to finish up in the sport in a video posted on his Twitter page. “There will be no more fighting from me,” said 35-year-old Bellew. The Liverpool native made his professional debut in 2007 and went on to win 30 of his 34 fights. He became the WBC cruiserweight champion in 2016 after defeating Ilunga Makabu at Goodison Park and won the British and Commonwealth light-heavyweight titles and European cruiserweight title. He also fought at heavyweight and twice defeated his compatriot David Haye in 2017 and 2018 before returning to cruiserweight where he lost out to Usyk. “I’ve had a fantastic career and realised my dreams,” Bellew continued. “If Eddie Hearn gets £100m together and offers me one more fight, what do I say? I’d say wow and then walk into the missus and say ‘Eddie has come on board with £100m’ and she would probably hand me divorce papers. Email “'There will be no more fighting from me' - Tony Bellew confirms retirement from boxing”. Feedback on “'There will be no more fighting from me' - Tony Bellew confirms retirement from boxing”.